Auto colour detection, blank page deletion, auto cropping, and auto de-skew. Auto colour detection, blank page deletion, auto-cropping and auto de-skew. 500 page feeder with Active Stacker for improved paper stacking. Zonal ultra-sonic double feed detection. 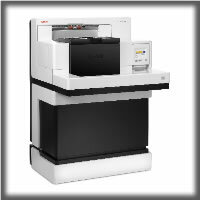 130 ppm/ 260 ipm scanning speed @300 dpi in colour, greyscale or black&white. 500 page feeder with automatic stacker. Ultra-sonic double feed detection (3 sensors).